A native of Mazatlán, México, José Adán Pérez is a dramatically expressive singer possessing a rich, ample baritone of significant presence, Pérez turned to singing after establishing himself as an engineer in the competitive automobile industry. 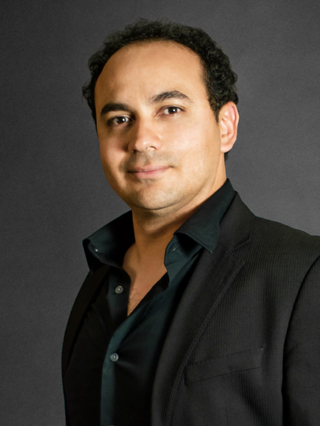 José Adán Pérez is an alumnus of the Domingo-Thornton Young Artist Program of LA Opera, Academy of Vocal Arts in Philadelphia, Aspen Opera Theater, IVAI Israel, andSIVAM Opera Program. He has appeared at the Hollywood Bowl as Dancaïro in Carmen with the LA Philharmonic under the direction of Gustavo Dudamel. Roles on the LA Opera stage include both Figaro and Fiorello in Il barbiere di Siviglia, the Second Senator in Schreker’s Die Gezeichneten under the baton of James Conlon, Di Cosimo in the world premiere of Daniel Catán’s Il Postino. and as Marcello in two student matinee performances of La bohème under the baton of Plácido Domingo. Recent engagements include returns to Los Angeles and New York for Figaro, 2010 and an impressive debut in San Diego as Dandini for which the San Diego Union-Tribune "Dandini was nimbly played by José Adán Pérez, a boffo buffa basso. There was firmness and suavity to his tone throughout his range, and he was one of the few people on stage able to generate laughter through demeanor as opposed to shtick." Elsewhere, he performed to high acclaim as Dandini in La Cenerentola at the Aspen Music Festival. made his European debut at the Theatre Basel, Switzerland as the lead baritone of the zarzuela Pasión under the direction of Calixto Bieito,Figaro in Il barbiere di Siviglia as part of Opera; Marcello in La bohème, Malatesta in Don Pasquale, and Guglielmo in Così fan tutte for IVAI in Tel-Aviv, as well as Figaro in Il barbiere di Siviglia, the title role of Don Giovanni, and Marullo in Rigoletto for The Academy of Vocal Arts of Philadelphia. In Mazatlan, Mexico, he has performed Figaro in Il barbiere di Siviglia, Belcore in L’Elisir D’amore and Silvio in I Pagliacci at the Teatro Ángela Peralta. Pérez has consistently distinguished himself in his musical pursuits. He was awarded a scholarship to Mexico’s most prestigious Young Artist Training Program, the Sociedad Internacional de Valores Artísticos Mexicanos (SIVAM) where he began his formal vocal training. He has been a winner of important competitions and scholarships, including awards from the Pasadena Opera Guild, the Gerda Lissner Foundation, the NOA Competition, Opera Buffs, Opera Index, and the Loren L. Zachary National Vocal Competition. He was a Philadelphia District Winner and Middle Atlantic Finalist at the Metropolitan Opera National Council Auditions. Other honors include a 2005 SIVAM – Plácido Domingo Scholarship and the INBA scholarship from the 2004 Carlo Morelli National Opera Competition. He currently lives in New York as an American resident.